Think of a political map (These are designed to show governmental boundaries of countries, states, and counties, the location of major cities, and they usually include significant bodies of water. Differing colours are often used to help the user differentiate between nations). it shows us where we are but it gives us borders between counties and the countries which may give an impression how we may be different from or similar to our neighbours. This study made use of the Human Connectome project which is plotting out how the nerves are interconnected. In this study they have down the same thing with the brain. Over 440 young adults were scanned and they have divided the cortex (outside of the brain) into 180 different counties (which have been called parcels like plots of land) in each half of the brain. Most previous parcellations were based on only one neurobiological property (such as architecture, function, connectivity or topography). In this study the finger print of each parcel was made (e.g. 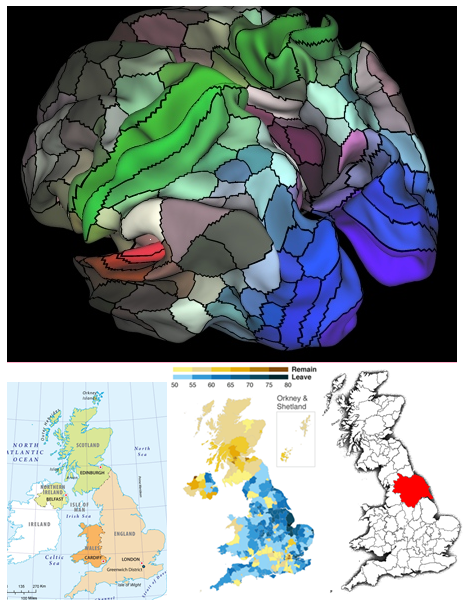 majority didn’t vote brexit; kilt not national costume; famous for spa water; in gods own country, so with just 4 categories = Harrogate) and in this study information included measurements of size; brain function; connectivity between regions; spacial organization of cells in brain tissue; and levels of myelin and used these to create borders. In the study this approach confirmed the existence of 83 previously reported brain areas but also found 97 new areas. This map was then tested in 210 different people and the map was found to be accurate (ordinance survey standardJ) but the size of the parcel may vary between different people. This was validated in another 210 people. However this is just the beginning as the map doesn’t yet include the biochemical underpinnings of the brain. Just as ProfGs tube map started with a few stations there will be more to come. By parcelling these areas it will help us to make structure to function relationships in even finer detail just as we map the hippocampus to memory and the cerebellum to movement. This may help us to delineate problems associated with MS where lesions in one area or pathway of the brain may link to different signs and symptoms.